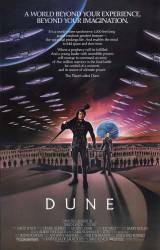 Continuity mistake: Depending on the version, in the final confrontation between the Emperor and the Harkonnen, and Paul and the Fremen, you can see Thufir Hawat standing in the crowd of the imperial side. After the battle between Paul and Sting he has suddenly disappeared. This is due to there being different, much longer versions of the same film. There is a 120 minute version, 180 and 190 minutes, and apparently in Singapore you can buy a 240 minute version. However, in the long versions the stains on Thufir's lips and Paul's totally blue eyes do not appear in the extra scenes: now you see it, now you don't. Trivia: David Lynch was disgusted with the elongated cut of the film which includes paintings of the 'robot revolt' back story to the original film, a sub-plot he deliberately omitted. He demanded his name be removed from the credits of the film and replaced with the Director's Guild nom de plume, 'Alan Smithee'. This was done so sloppily, by superimposing Smithee's name over Lynch's, that the credit reads "A ALAN SMITHEE FILM". Trivia: The tendons on the worm when it gets hooked by Paul are made from condoms. Trivia: The TV version of this film lists a Mr. 'Judas Booth' as the screenwriter. Allegedly this was to get back at David Lynch (who was both screen writer and director) for so brutally condemning and demanding that all credits to him be removed from the film's re-edit for TV. The name is a combination of Judas Iscariot, the betrayer of Jesus, and Abraham Lincoln's killer, John Wilkes Booth. Paul: I'm dead to everyone unless I become what I may be. Piter De Vries: As you instructed me, I have enlightened your nephews concerning my plan. Piter De Vries: ...the plan... to crush the Atreides. Question: Admittedly the sound on my copy of this movie is lacking somewhat but when Paul is researching Arrakis and Gurney et all enter I swear I can hear the trailer for the movie playing in the background. Am I correct on this? Chosen answer: No. At least, not on the DVD I have. It does play the title tune in the background, though.